At Aphrodite you will find beautiful bff necklaces . Surprise your girl friend with a beautiful bff necklace. I’m sure she’ll be happy with it. We have bff necklaces with nice pendants such as, heart, infinty, unicorn, pizza and circle. The bff necklaces are available as a set. You will both get a share of the heart. Wear one of the necklaces yourself and give a bff necklace to your girl friend. Friendship is something beautiful and that should be celebrated. You can also give the bff necklace to your sister, mother or someone else who is dear to you. With the bff necklaces from Aphrodite you can show how much you care about that special person. The bff necklaces have a minimalist design. They are avaible as a set with 2, 3 or more necklaces. The great thing about jewelry with a minimalist design is that you can easily combine them with other lovely jewelry. Wear your new bff necklace with beautiful minimalist necklaces. This is how you make your own layered necklace. It will also look great in combination with a choker. You can also combine the friendship necklace with nice stylish earrings from Aphrodite. For example with beautiful stud earrings or with nice minimalist earrings. We also have beautiful fine bracelets! You can also wear it together with your new bff necklace. Wear multiple minimalist bracelets with beaded bracelets for an arm party. Be sure to take a look at our category bracelets sets. We have beautiful bracelet sets with 2, 3, 4 or more bracelets. Sign up for our newsletter! 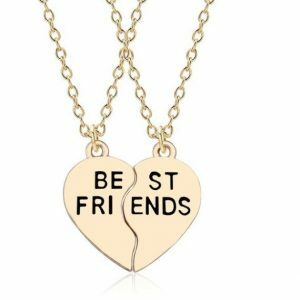 this way you will always be informed when we add new best friends forever necklaces to our collection.